Welcome news on the returning adult Ring-billed Gull with an injured right leg present today on the playing fields along Springdale Rd. between Coolock and Raheny.AK It regularly commutes down to the channel just north of the causeway on the Bull. Pat Lenihan took this photo of an adult Ring-billed Gull on 18 February on the north side of the causeway. The same bird?? Thanks to Bill and Heather, the indefatigable Tolka Two, who remained in the Gambia and Senegal for a third week we now have a trip total of 296 species over the three week period. 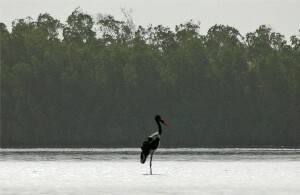 Bill took this picture of the very rare Saddle-Billed Stork . See also 9 February below. Full trip report with more of Bill's amazing photos will follow soon in the Foreign Trip report section of this website. Two Black Guillemots present at dawn today at the sluice gates beside the Sean O Casey Bridge at the IFSC. Siskins have been reported at feeders on South Dublin gardens since the weekend. Pale 1st winter Iceland Gull at Poolbeg NK. Today's Tolka Branch outing to the Louth coast proved once again that birding with Tolka is the best thing to do on the third Saturday every month! Not only did the Spring sunshine drench us but the birds were there with ticks for many of us! Highlights were Ruff and Reeve, Long-tailed Duck x 8, Common Scoters and........the Long-billed Dowitcher at the Dundalk docks . See full trip report in the Trip report section of this website! No sightings reports today! Not even love birds!! There was a Cormorant and a Grey Heron on the canal at Portobello. Over 80 Sanderling were on Sandymount strand at high tide this evening. A Chiffchaff, 4 Bullfinches and a Dipper were seen today in Dodder valley park. 2 Great Northern Divers were seen off the base of the east pier with 6 Mediterranean gulls seen in nearby Sandycove. The pair of Dippers were again on show behind Rathfarnham shopping centre with a Kingfisher and a pair of Bullfinches seen nearby. Green Winged Teal with Common Teal at Rogerstown today. A Pink Footed Goose was seen at Rogerstown today.4 Redpoll and 2 Siskin feeding on nut feeders at Stiles Rd, Clontarf.